Some supposed palaeontologists (and others with even fewer claimed credentials) were ribbing on the new Jurassic World trailer for not being scientific enough in their latest depiction of extinct animals gone wild. I do believe they are missing the point of science fiction, but I suppose there’s something to be said for plausibility. Frankly, I think they already threw that out the window casting Chris Pratt in a serious role… I guess we’ll see though. At least I’m willing to suspend my disbelief. Hey, do you like history? Or do you aspire to like history? I was recently a guest on HI101, a history podcast with a twist, the twist being that it’s in a casual format and the guest has little knowledge on the subject. We had a lovely chat about Napoleon. You should check it out. The show runner, Adam Bleskie, does a fantastic job – www.hi101.ca. The second half of the episode will be posted half-way through the month. I’ve seen some of the criticism on the trailer by paleontologists, and I think they have sort of missed the mark. The point that the paleontologist in Jurassic Park made was that the monsters engineered in the park were not true dinosaurs. The gaps formed from degradation in the genetic code were filled with modern amphibious and reptilian dna. True, modern scientists say that dinosaurs might have had feathers or down, but (if you stay true to the plot of the original movie) the difference in appearance could easily be explained by their engineering process. Also, agreed. 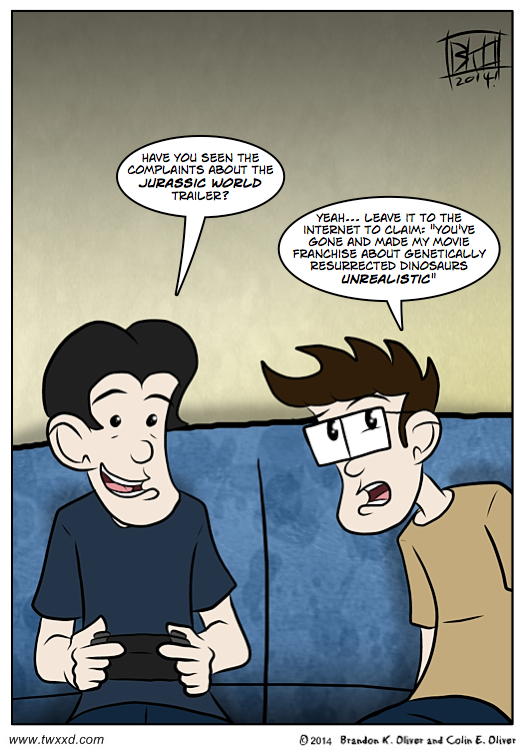 I’m not going to see Jurassic World for the scientific accuracy!